Last week I finished the Mod Aqua II quilt that I did as a commission for the lovely Annette in Germany. Now, if you are Annette than you are not allowed to read any further until the quilt has made it through the snow to you. 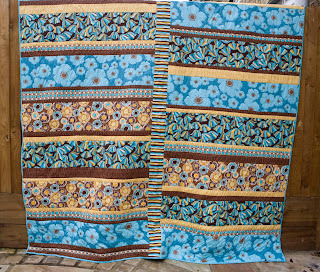 This quilt is the biggest so far with about 2.10 square (that is about 84 inches) and was made from the same fabric as the the first Mod Aqua but this time I used the entire aqua collection. 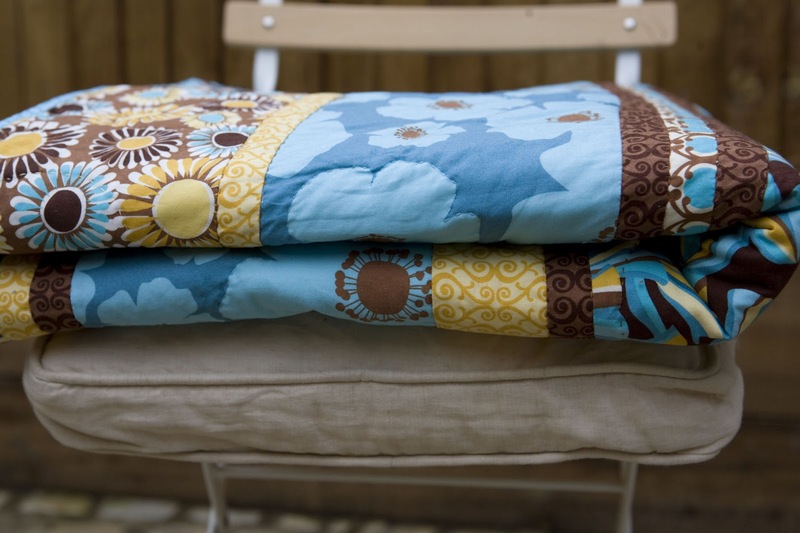 The brief from Annette was that she wanted to be able to cuddle up under the quilt with two kids and husband. 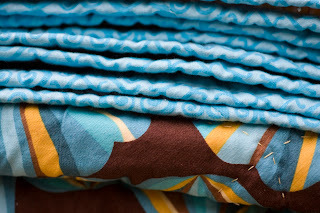 I designed the quilt in two large blocks of strips of varying sizes. The fabric is from Robert Kaufman and is called 'Mod Green Pod Free to Grow'. Wadding as usual is Quilters Dream Select weight. 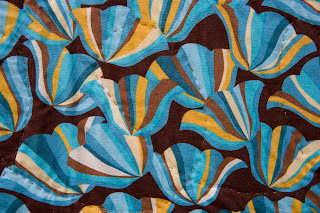 I divided the back into two parts and added a strip of the aqua flowers and petals from some leftover fabric to lift the brown panel somewhat. Annette mentioned that she really likes the colour aqua and I hope she is happy with this detail. 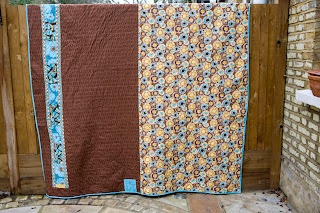 I quilted along the sewing lines and added detail to each of the bigger blocks. 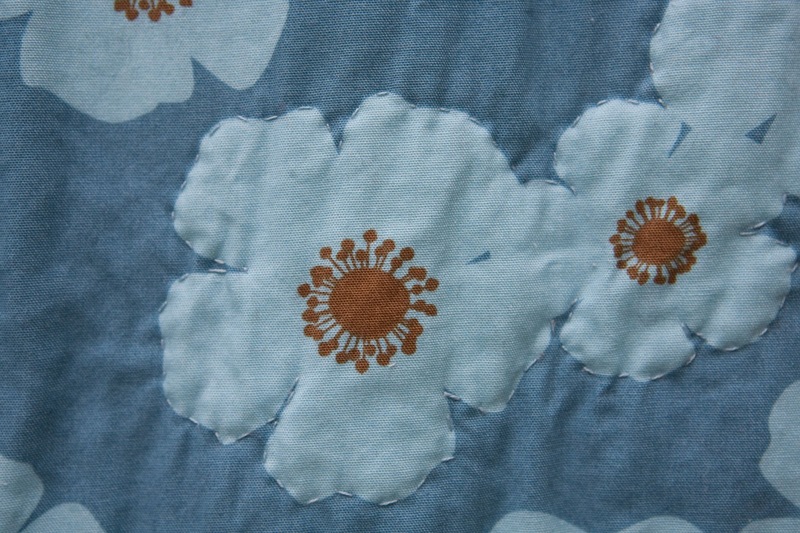 The petal blocks were quilted in free motion hoops and I simply quilted around the large flowers. Circles were quilted on the multicolour panels. 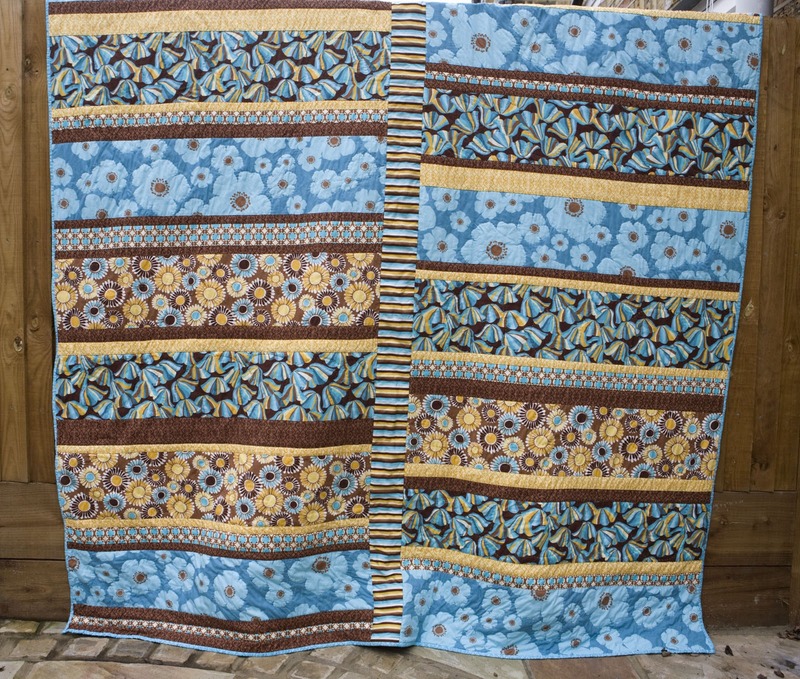 All quilting was done by hand and I used three different colours; aqua, yellow and brown. 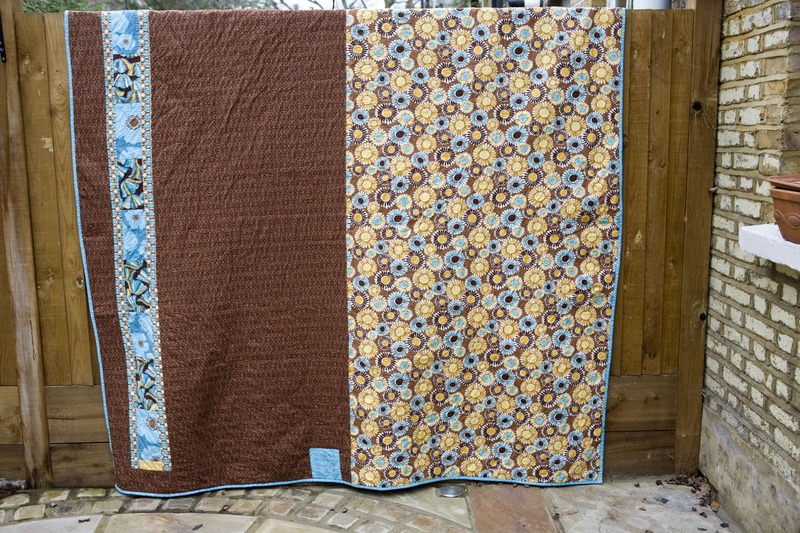 All the 'quilt in the ditch' sewing was done in brown and the detail in varying colours. Overall this quilt is not as heavily quilted than the first version thereby keeping it more flexible. 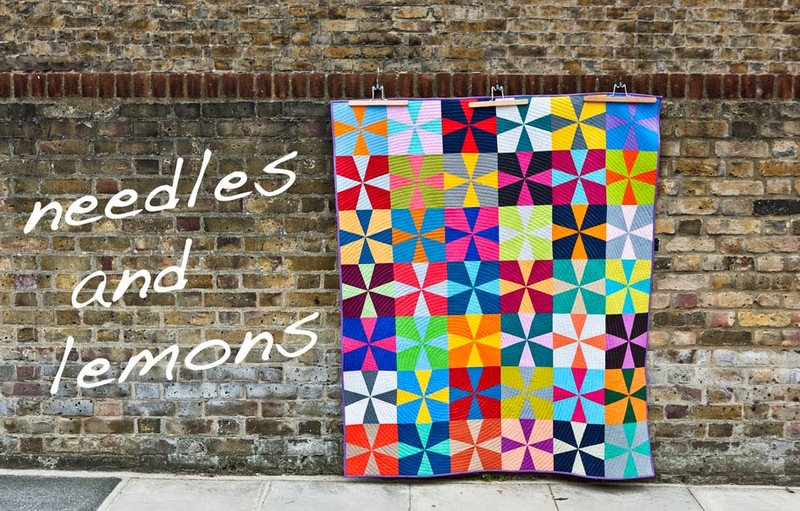 I pondered about how to label the quilt as this is the first I have sold. 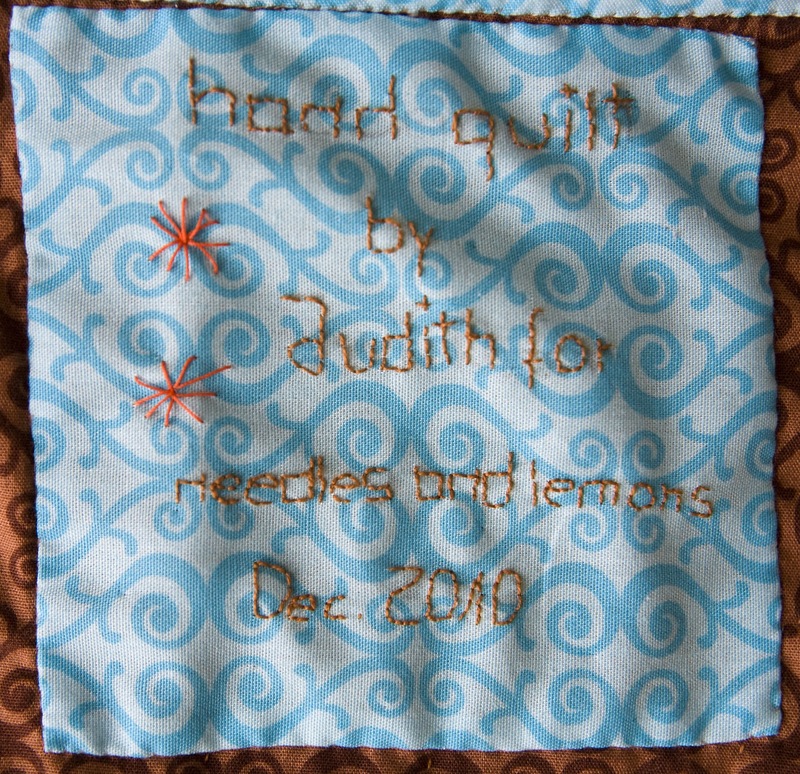 I did order labels that say "handmade by Judith for needlesandlemons.com but didn't really like them on this large quilt. Somehow it managed to both stick out light a thumb and disappear all together. In the end I decided to embroider a label using a piece of the fabric. This turned out really nice and I think adds more of a personal note. 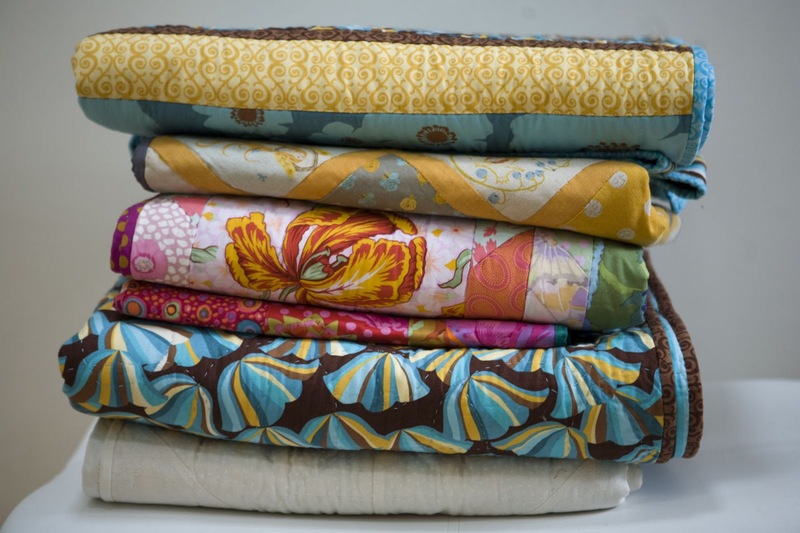 The binding was done in the same fabric as the label and gives the entire quilt a very fresh appearance. 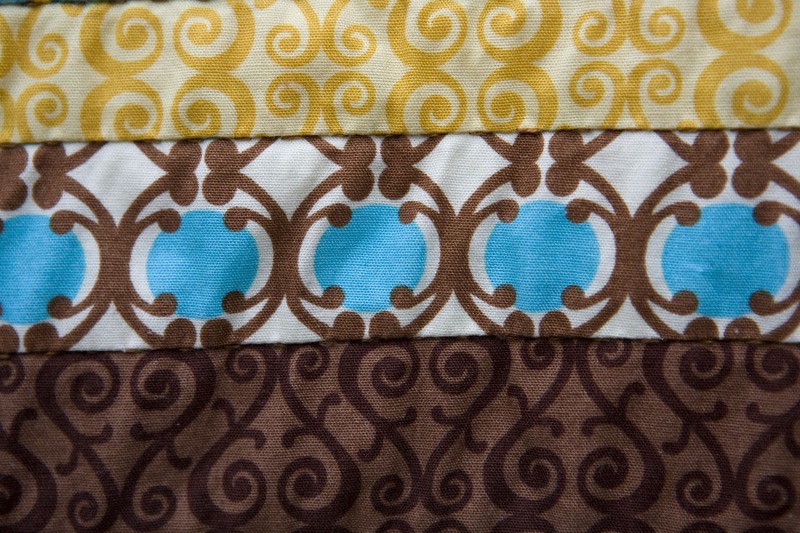 I am always amazed how much influence binding has on the entire quilt. In fact I think binding can change the mood of a quilt entirely. Folded and waiting to be used. 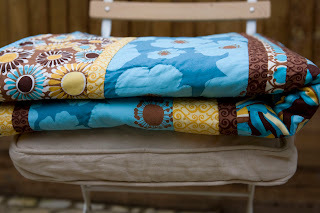 I am absolutely in love with this quilt and feel it sort of emits warmth and summer. What I like in particular are the thinner yellow strips. I can't really say why I just do. 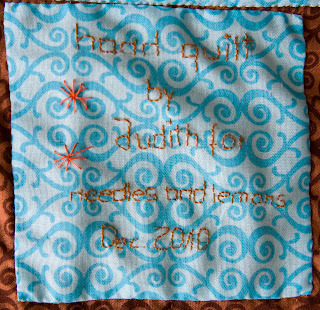 Well Annette thank very much for this commission and I hope you, kids and hubby enjoy being cuddled by the quilt.